While local supermarkets and restaurants have expanded their seafood offerings over the years, one can never be sure just how long fish has been in the freezer, or just what varieties of seafood will be available at any given time. Many Centre Countians only truly experience fresh seafood while vacationing on the Eastern seaboard. Shaun Knight and Christa Stofferahn are changing all that. In August 2017, they opened Maine Bay & Berry, and since then, Knight has been making the 12-hour trek to Maine three or four times each month to bring back fresh seafood straight from New England to State College. “I literally go onto the boat and pull the lobsters out of the water myself,” Knight says. Born and raised in Winter Harbor, Maine, Knight taught in the Smeal College of Business at Penn State for 15 years. During that time, he would bring back seafood for his colleagues whenever he went back to visit family in Maine. As luck would have it, an opportunity arose one night as the two were driving back from a visit to Maine. They contacted the landowner and signed a lease for the stand in July. 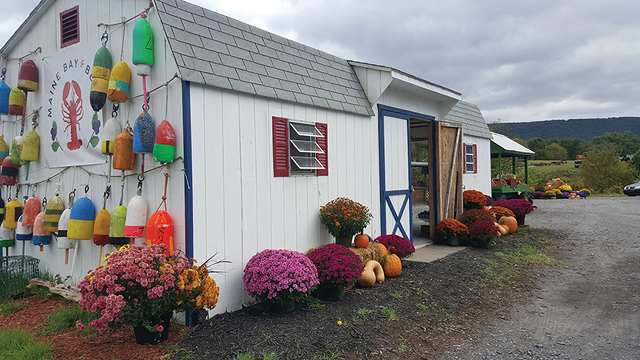 They decorated it with buoys and lobsters in the tradition of the authentic Maine seafood shacks, and opened for business on August 1. “The initial vision was, we would start out selling lobster and corn, for lobster boils. But we quickly realized that for 20 years people recognized this as a produce stand. They were not looking for seafood there, they wanted produce. So we ended up getting into the produce business in a hurry,” says Knight. As word of mouth spread about the stand and the high-quality seafood offered, the business grew quickly. Because the shack is not heated and is considered a temporary business in the eyes of College Township, it is operational for only nine months a year. By December, Knight and Stofferahn had built a loyal customer base and they wanted to find a second location where they could continue to offer the community the fresh seafood they’d come to expect. Stryker is the owner of The Barn at Lemont, a retail space on Elmwood Street that started as an organic gardening center, and has expanded to include an eclectic mix of products from small, family-run businesses, with a focus on sustainability. Products found at The Barn come from local vendors such as Shade Mountain Naturals, Mount NitanNee Kombucha, Bone Bar & Boutique, Creekside Hearth & Patio, Hungry Run Wine & Spirits, KingView Mead, Soggy Fleece Farm, and Fasta Ravioli Co. The Barn offers classes and workshops on topics like beekeeping, hydroponics, make-and-take deodorants and bath bombs, micro brewing, and even bonsai gardening. “You can come in here and you can buy a hydroponics set-up, a natural dog treat, some essential oils, shampoo, and fertilizer, all in the same place. I like that about it,” Stryker says. Stryker certainly practices what he preaches when it comes to sustainability. “Throughout my life, if I had a passion for something I pretty much learned how to do it myself and started a business for it, because I hate paying retail price for things,” he says. “So, I was looking for a new table, and saw the stores were asking $5,000 for a dining room table, and I thought, ‘I can build that.’ So I went and built it, and started a business doing custom woodworking and construction. When he realized how much he was spending on produce in the grocery store, he decided to invest in an indoor hydroponics system that allows him to grow vegetables all year long. Most recently, when he started looking into the cost of buying signs for The Barn, he realized he could buy a vinyl cutter and learn to make signs himself for just a little bit more. Stryker’s emphasis on sustainability, family-run businesses, and customer care is very similar to the philosophy of Knight and Stofferahn, he says, so when space became available on the lower level of The Barn, he felt Maine Bay & Berry would be a good fit. Maine Bay & Berry opened the location at The Barn in early January. The space is lined with coolers filled with seafood, from oysters and little neck clams to salmon and scallops, and even live lobsters and crabs. All of it comes directly from fishermen that Knight either knows personally, or from small businesses he knows enough about to personally vouch for the quality. The business is regulated by the Department of Health and the Department of Agriculture, just like a restaurant would be, and everything qthey sell is 100 percent guaranteed, Knight says. Knight says restaurants and catering companies have taken notice of the young business and are interested in some of their fresh products. “We are certainly open to that,” he says. While Maine Bay & Berry’s fresh and diverse seafood offerings are certainly the main draw, a wall of wooden shelves in the shop is devoted entirely to other Maine-produced merchandise including jams, syrups, salts, sauces, and soaps. They also carry Maine wild blueberries, and their biggest seller: New England Bog Pies. Knight plans to re-open the Shiloh Road stand in April. He will mind the stand for nine months, while Stofferahn will run The Barn location. They felt it was important to keep the stand running because of their loyal customers who have come to rely on it.